If you were to lay out, end to end, all the skeens of yarn piled high in the office of BLC volunteer Coordinator Lisa Browns office it would go for at least a mile. That’s a mile of beautiful, high quality, donated yarn. For the past couple of months volunteer knitters have been busy turning all this yarn into scarves, hats and mittens for BLC members. So far the knitting group has created 54 scarves, 18 hats and 3 pairs of mittens. These aren’t just your regular, run of the mill winter scarves either. 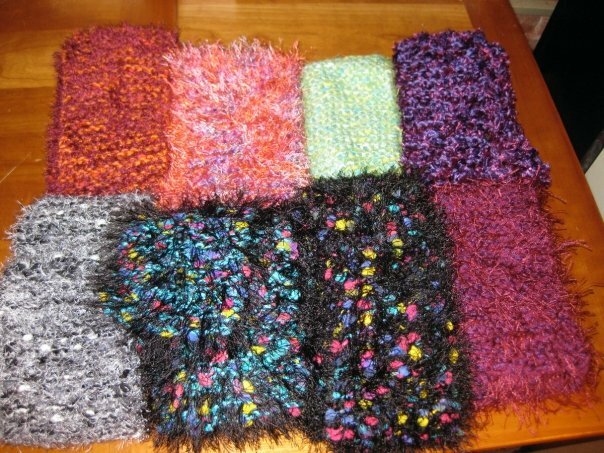 These scarves, crafted with love by BLC volunteers, are cozy, stylish and full of color! We’ve got ones with fringe, ones with ribbon, ones with patterns and other with spirals and bobbles. They are each truly works of art! are all quite colorful and definitely warm. On Saturday, December 19th the BLC will host its annual family holiday party. 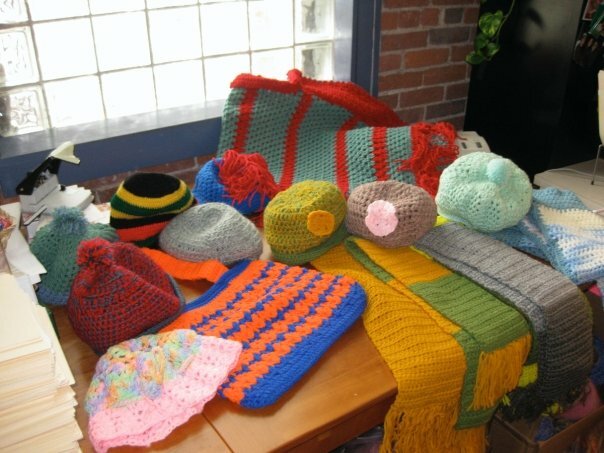 The scarves, hats, mittens and accessories will be given away to BLC members and their loved ones. With the rapidly dipping temperatures the warmth of a new scarf or hat will mean the world to a BLC member on those chilly days walking over the BLC for lunch or dinner. volunteer knitter models the goods! Kristin is a long time volunteer massage therapist here at the BLC. Welcome to the team! Ever run a marathon before? Nope! Favorite post race snack? A big bowl of steel cut oats with a super ripe, frozen banana and a big scoop of crunchy peanut butter with ground flaxseeds. 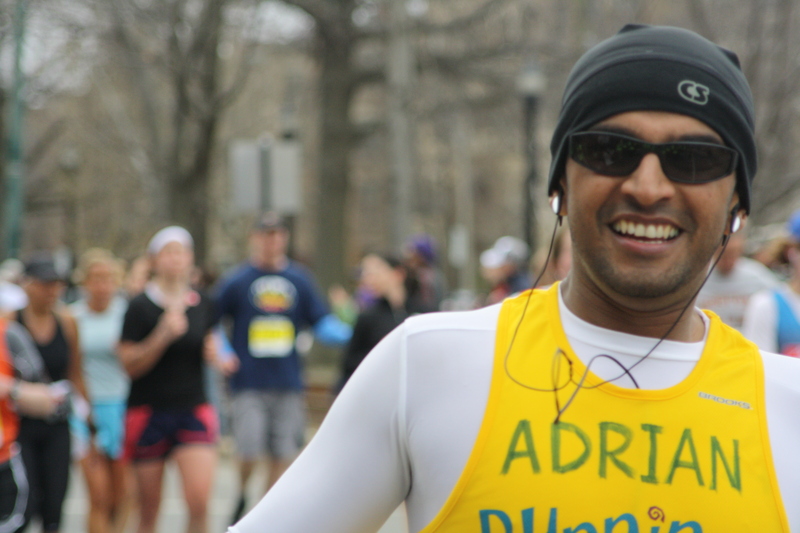 Most exciting thing about running the Boston Marathon? The build-up in training and the suspense leading up to Marathon Monday is really exciting, but I think the fact that I know firsthand what and who will benefit from my fundraising and efforts is the best part. I can’t run a marathon without my…iPod nano! I use the camera on it to take videos of some of my running routes, so that I can show my friends and family. I’m also never to be found without chapstick or my inhaler. What does running for the BLC mean to you? I’ve been volunteering at the BLC for about a year as a massage therapist and I always wanted to be able to contribute on a larger scale. So when the opportunity came about to run the marathon as part of the BLC team – I didn’t need to think twice. Being able to wake up super early, challenge myself and run with a purpose is extremely gratifying. I try to imagine the starting line, the hills, and what it will feel like to run past the BLC’s cheer squad toward the finish line and it helps me power through my runs – especially on the icky days. How are you training for the Marathon? Carefully! I’m doing an 18-week program with four days of running, one day of cross training and two rest days. I’m also doing some core and strength training, and of course – I’m getting a lot of massages! Favorite song to get you up Heartbreak Hill? It’s too hard to pick just one! I would have to say my current, pavement-pounding go-to songs are: “Best of You” by the Foo Fighters, anything by Rage Against the Machine, Lincoln Park, Beastie Boys or the Canadian fiddler, Ashley MacIssac and “Hard Sun” by Eddie Vedder (that’s the current fave!). 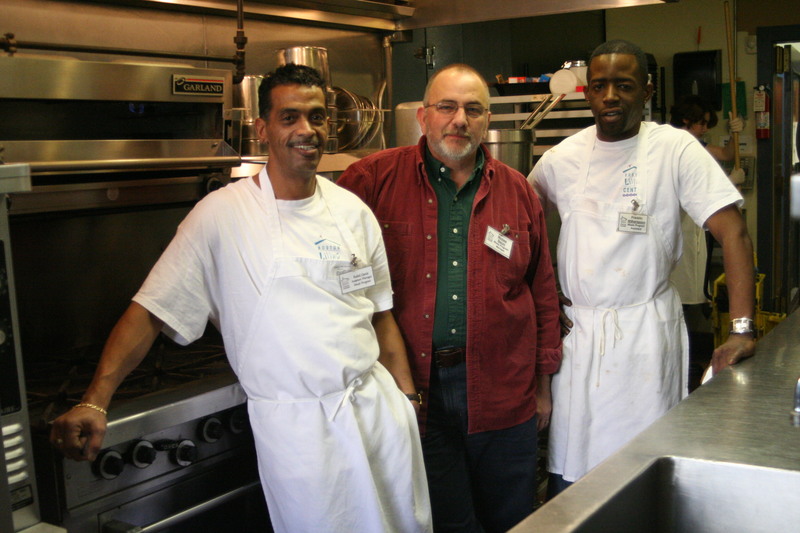 My name is Michael Bacon, and I am the Director of Nutritional Services here at the Boston Living Center. I manage the Meals Program and also oversee the Nutrition Works Food Pantry, a collaborative program between the BLC and the American Red Cross of Massachusetts Bay. I have worked at the BLC since 1996 and I am going to let you know why it is important that you consider to support the work of the BLC. When I started working here, I thought the epidemic would be over within a couple of years, researchers would find a cure and that would be it. Now, almost 14 years later there remains hope, but still no cure. People often ask me why I got involved here, or more incredulously, how I have lasted so long. Introducing the fabulous Kelli Rupert. She’ll be running the Boston Marathon for the BLC this year! Ever run a marathon before? No, this will be my first of many…I am officially hooked on running! Favorite post race snack? Spoonful of peanut butter, right from the jar!! I can’t run a marathon without my…Garmin405 watch that tells me my distance, pace, time, calories and heart rate using satellites…It makes every run a measured sense of accomplishment. What does running for the BLC mean to you? The BLC is giving me the opportunity to reach a personal goal of running 26.2 in front of family and friends as well as making an impact in my local community. I really believe that the most important thing you can do in your own life is to make a difference in somebody else’s…and I am excited to do that with the BLC! How are you training for the Marathon? I am using an 18 week plan; 5 days of running, 1 cross training day, 1 rest day, and a whole lot of ice each week!!! Have you ever run a marathon before? I’ve run two Marathons before: Jacksonville Marathon last Christmas and the Boston Marathon this past April. 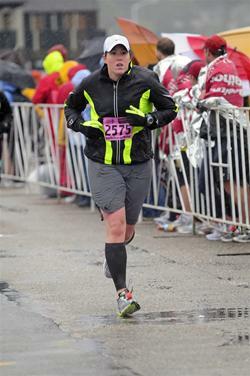 My Boston time was 4hours 14mins, but my goal is under 4 hours this year!! 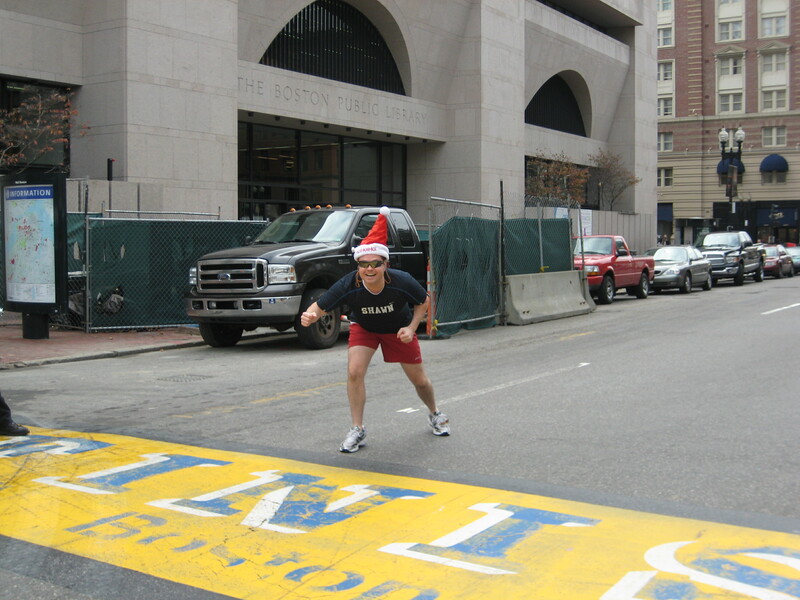 What is the most exciting thing for me about running the Boston Marathon? Its not as much about the cheers on April 19th as about the journey getting there. Completing each run turns into a series of small personal victories. The friendships you make with others who are training and also experiencing these victories is truly second to none. Discovering these new friends is what is exciting! Can’t run a marathon without my…I’m a gadget dork and can’t run without my Garmin Forerunner. It’s a cool GPS-enabled watch that displays your pace and the distance you’ve already run. I’m pretty sure it tells time too, LOL! What does running for the BLC mean to you? Running for the BLC means giving those that are living with HIV/AIDS a sense of hope. I always describe hope as the springboard that one can use to jump over even most daunting obstacles. How are you training for the Marathon? I’m training for the Boston Marathon this year with the L Street Running Club. They are fantastic club out of Southie with over 1000 members. The Sunday long runs can easily top 180 people, which is very cool (and much needed) when you’re struggling — misery loves company! Favorite song to get you up Heartbreak Hill? Although I listen to music when I run alone, I don’t when I train with a group and definitely won’t when I run on Marathon Monday. I find it distracting and interrupting my internal dialogue (and screams..LOL!). I will use the screams of “Go Shawn!! !” to get up Heartbreak Hill. Ever run a marathon before? This will be my first marathon. Favorite post race snack? Peanut butter and bananas…yum! Most exciting thing about running the Boston Marathon? I have volunteered for the Boston Marathon the past two years helping with baggage return for the runners with a group of students I work with at Mount Ida College. The energy and sense of accomplishment was visible with all the runners we helped. I feel it will be exciting for my students to greet me at the finish and be able to congratulate someone they know. I can’t run a marathon without my…IPod…can I wear one? What does running for the BLC mean to you? It gives my achievement a bigger purpose, not only will I be running my first marathon but I will be running to make a difference for an important non-profit organization in Boston. I know that the money raised will be used to continue to provide much needed meals, services and programs for the BLC members. How are you training for the Marathon? I have started training with my partner who is also on the team. We are working in some long runs on weekends(have already done a few 13+ mile runs) and will be joining the L Street Running Club or the Brookline running Club in the near future to get some shorter runs in during the week. Favorite song to get you up Heartbreak Hill? All Fired Up by Pat Benatar, a motivational flashback from the eighties. This song has helped push me for years. Adrian, who ran for the BLC last year has returned to run again! Hometown: South End of Boston, MA — but, I grew up in Guyana, South America. Ever run a marathon before? Yes. This will be my 4th. Most exciting thing about running the Boston Marathon? The energy from the crowd. They are all there to see us cross the finish line. What does running for the BLC mean to you? A place of hope and community. Favorite song to get you up Heartbreak Hill? No song. Just the sound and cheers of the crowd. It really motivates you to keep going.